DENTISTRY’S LOST ART? NOT ON MY WATCH! I opened my first dental laboratory in downtown Seneca Falls in 1948. Initially I worked alone, utilizing the experience I gained as a dental technician in the military to guide me. As a small denture lab I had a handful of local customers to support myself, and took great pride in fabricating high-quality dentures and partials for their patients. My focus on “craftsmanship first” was the foundation on which this business — which has now been in my family for over 60 years — was built. The last six decades have inevitably brought many changes, not just to my family’s lab, but to the dental industry, as well. While we incorporated additional products and technologies to become a full-service lab many years ago, dentures have always held a special place in my heart. Sadly, however, it seems that much of the dental industry has begun to push this restorative “grandfather” a bit to the wayside. It’s not that dentures aren’t reliable, nor is it that dentistry has grown too advanced of the methodology itself. I strongly believe that dentures still have their place, even today. With uncertainty surrounding the economy, the demand for something a little easier on a patient’s wallet will continue to increase. Not everyone can afford bridgework or implants, and dentures are made to last (I’ve personally manufactured dentures for friends that to this day have seldom needed relining, repair, or replacement — and we’re talking about work I did decades ago!). Removables don’t have to be any less comfortable or reliable. And they certainly aren’t less esthetic. 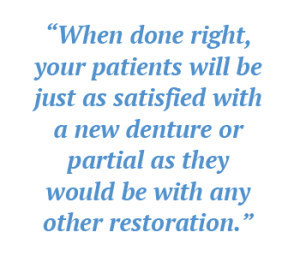 When done right, your patients will be just as satisfied with a new denture or partial as they would be with any other restoration. The key is to keep an eye toward the intricacies of the craftsmanship and maintain good communication with your laboratory. Dentures are not one-size-fits-all. 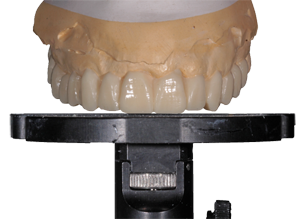 Every denture takes careful handling in fabrication, and the more details you provide in your Rx, the less you’ll have to worry about multiple resets and lost chair time. The best way to communicate with the lab is to give them the clearest impression you possibly can. Use the latest impression techniques, and whatever you find to be the most accurate registration material, in your opinion (personally, I used to recommend Accu-Dent, but these days really any silicone-based material works well). Be sure to pick up detailed muscle trimmings — that’s the most important part. We also recommend using custom trays, as this prevents tissue distortion, and minimizes impression material distortion. 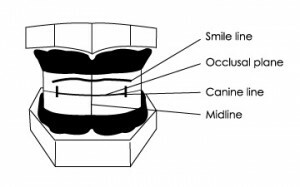 It’s also important to communicate information like bite registration, the lip line at rest, the smile line, and the midline (Image B). The midline can be particularly important because while the lab can typically just use the incisal papilla as a landmark, the incisal papilla has been known to shift under certain circumstances, and as such cannot always be relied on. By marking the midline in the office, you ensure accuracy earlier in the process, again eliminating the need for resets. A good description of the patient’s facial characteristics is also helpful. In fact, a photograph of the patient is an excellent communication tool for our technicians. Why save photography for just your crown and bridge cases? We can use that photograph to determine if the patient’s face is masculine or feminine, round or square, etc. — which will then aid in proper tooth selection. Having thorough information, specific and unique to each patient is important for case success. I’m proud of the technical team we’ve assembled at BonaDent. They genuinely take pride in continuing my tradition of quality removable craftsmanship. To this day, I still work alongside our denture technicians to instill in them a love for the craft, for the final result, and for the positive impact on the patient. By working together with you and your team, we’ll make sure that the “Art” of dentures is never lost. 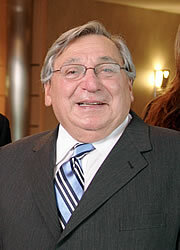 Angelo Bonafiglia opened his first dental laboratory in Seneca Falls in 1948. 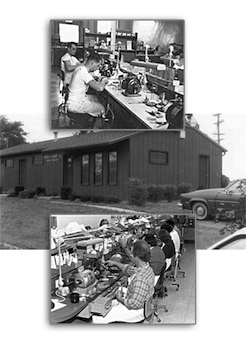 After several years of steady growth, Angelo opened a larger lab in 1954 in nearby Auburn, NY. He received CDT certification in Dentures, Partials, Crown & Bridge, and Ceramics in 1960, the first year that national certification took place. This coincided with the business continuing to expand and grow much as it does today. While Angelo’s son Bruce bought the business from his father in 1986, Angelo continues to spend his days in the lab, working at the bench, training other technicians, and remaining intimately involved in nearly every aspect of the business. Have questions for Angelo about what you can do to ensure your patients are consistently provided with beautiful removable restorations? Send him an e-mail at fillinginthegaps@bonadent.com. To learn more, visit our website at www.bonadent.com. What if I get the final restoration back but the occlusal plane is canted or the midline is off? 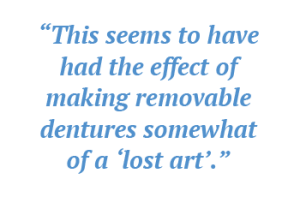 What if the final restoration doesn’t replicate the provisional contours my patient is madly in love with? Nothing makes your heart pound more than the idea of having to send a case back and forth to the lab for multiple adjustments, or — worse yet — a remake. Well, you can put those worries behind you. I’ve been working closely with our Anterior Specialists at BonaDent to develop an easy-to-use kit for dentists of all ages and experience levels. We call it the Anterior Expert Kit (AEK), and in it we provide dentists with the highly specific tools necessary for handling the challenges associated with Anterior cases, large or small. Taking the time to think through the case with your laboratory before proceeding is critical. Knowing what can and can’t be achieved plays a crucial role in case design and material selection. For assistance with treatment planning, we’ve included the Kois Dento-Facial Analyzer, an essential instrument that will guarantee that all the models — from the diagnostics to the provisional to the model work the final restorations are fabricated on — are properly mounted. This ensures that the restoration’s incisal edges, occlusal table, and midline are all properly oriented to the patient’s facial midline (Images B & C). 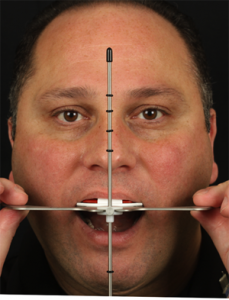 The Dento-Facial Analyzer also improves upon the traditional “stick bite” as it can be mounted to an articulator, producing consistently predictable results. And the best part is that the removable, disposable index tray with the bite registration is all you send to the lab. The Analyzer itself always stays at your office, ready for the next time you need it. From this mounting plate we can begin the diagnostic wax-up. I discussed the importance of diagnostics in an earlier blog, but will take a moment to reiterate how this very critical step will ensure that the case blueprint is properly designed and executed before moving on to the prototype or provisional stage. We’ll use this diagnostic to produce reduction guides as well as the prototype provisional that the patient will wear to try out their new smile. When it comes to shade, our motto is “Stop taking shades and start taking photos.” Believe it or not, when using the AEK, we’ve asked you to stop selecting shades altogether. We’re more interested in your photography. Before prepping the teeth, simply photograph our 8 shade tabs (included in the kit) edge-to-edge with the tooth you want us to match – it’s really that simple! (Image D) (See our recommended camera system and settings here.) Once completed, our Anterior Specialists will accurately determine the correct value, hue, and chroma for the restoration(s) being created. For your convenience, we’ve included a custom designed selection of burs for adequate reduction when preparing both full coverage and veneer cases. In addition, you’ll find three-dimensional models of ideal preparations for your reference. To ensure that you achieve proper reduction, the AEK includes a highly accurate dial caliper. As mentioned previously, at the diagnostic phase we’ll provide you with a matrix of the approved diagnostic. When making your temporaries, simply inject your provisional material into this matrix and seat your preps (Image E). Remove the temps and take a measurement of their thickness using the dial calipers (Image F). Ideally, the thickness should be about 1.2mm at the incisal third. This guarantees that our ceramists have enough room to build those same contours into the final restoration. 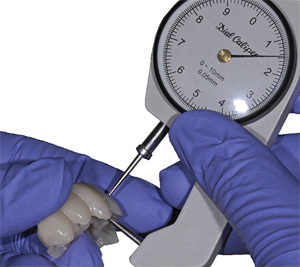 If you’ve ever heard a patient say, “I liked the shape of the temps better,” or “These look/feel bulky” after receiving the ceramic restorations, the caliper thickness check at the temporary appointment will eliminate these concerns in the future. If, after checking temp thickness, you find it is too thin to replicate in ceramic material (feldspathic, lithium disilicate, etc. ), you have the opportunity to make final prep adjustments while your patient is prone and available. Despite the usefulness of each of these tools separately, the greatest benefit of the AEK may be that it’s all in one place. All the materials stay in the box, ready to use when they’re needed. And the kit itself functions as an impressive presentational tool for you to your patients. Nothing says “Expert” quite like displaying the Anterior Expert Kit in your operatory and confidently getting to work with all the features provided. Leave your worries about canted midlines, missed shades, or the need for remakes behind you. With the AEK, you have all the tools necessary for delivering great results the first time, every time. Become an Anterior Expert today! Have questions for Joe about how our kit can turn you into an Anterior Expert? Send him an e-mail at fillinginthegaps@bonadent.com. "Filling in the Gaps" posts. PreciZion Bridge delivers a highly esthetic solution that combines zirconia's strength, screw retained ease of retrievability, and the precision of a titanium implant interface. BonaDent's Anterior Specialists have assembled tools and techniques to enable our customers to achieve predictable and profitable results with every case. 4175 W. New Haven Ave.